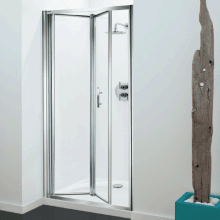 By opting for bifold shower doors, it allows for large amounts of space to be saved due to the way in which these doors fold in on themselves and provide an easier experience when entering and exiting the shower. 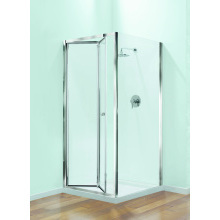 The door is split down the middle which allows it concertina fold upon itself, which reduces the clearance space required outside of the shower enclosure. 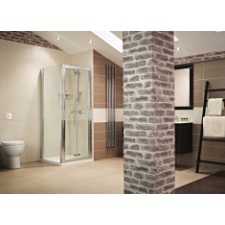 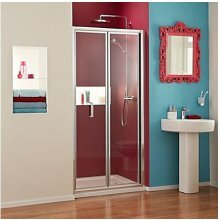 This makes them ideal for smaller bath and shower rooms where space is at a premium, and an elegant solution to a common problem. 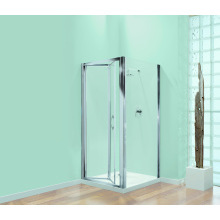 Our range of bifold shower doors come in both 760mm and 800mm sizes, with thick ultra care coated durable glass, left and right hand fixing and more.